Paper Heart font here refers to the font used in the poster of Paper Heart, which is a 2009 American romantic comedy movie that follows Charlyne as she embarks on a quest across America to make a documentary about love. The font used for the movie title in the poster is probably Eagle Bold, which was originally designed by Morris Fuller Benton as a single weight titling font and then redesigned and expanded by other designers. The typeface now is available in four weights, Light, Book, Bold and Black. You can view more details about the typeface here. 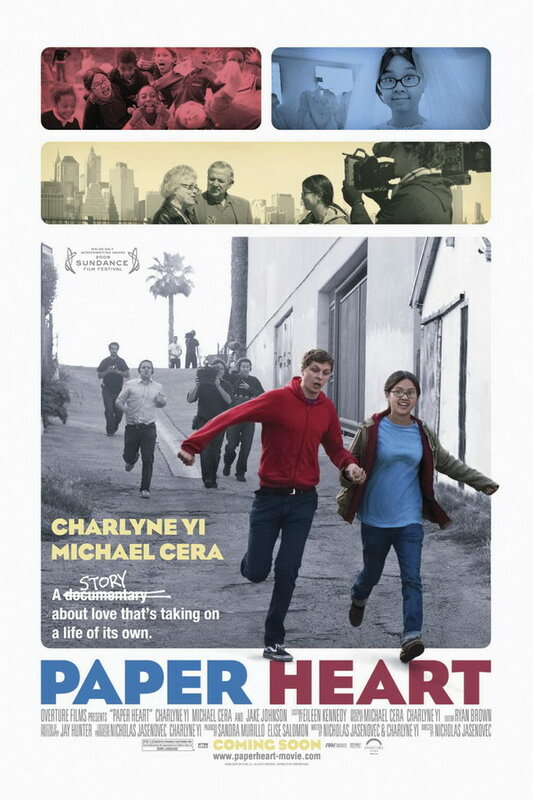 In addition to Paper Heart, Eagle typeface is also used in the following logos, movie posters or album covers etc., including: Green Mountain Coffee, Nivea, Planes, Moonwalker (film), Junk of the Heart, Persepolis, Inditex, The Onion, The Reluctant Fundamentalist, Inside In/Inside Out.